Flacks, this is not how to impress someone from the media. Just in case you aren’t seeing this correctly: That is an email from a reporter with the New Jersey Star-Ledger and that is a response with a highly loaded eff bomb. Nice. Meet Michael Drewniak, he’s a little bit of a douche for thinking he can talk to a member of the press like that (even if he intended it to be behind his back), but he’s also Gov. Chris Christie’s spokesperson. Yeah, hurts to miss that one. Just when ‘BridgeGate’ couldn’t use any more fire, here comes the Gov’s mouthpiece spewing out gallons of kerosene. This is not the first time Drewniak has gone all Andrew Dice Clay on a reporter. 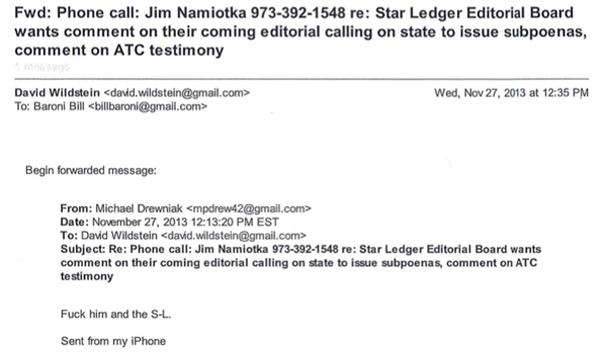 “Such a (expletive) mutt,” Michael Drewniak writes in an email sent in October to David Wildstein about a Star-Ledger reporter seeking information about the George Washington Bridge closures. According to a story in the Trentonian (N.J.) newspaper, both emails were sent on Drewniak’s private email account a couple months after the politically-motivated lane closures were set in motion, and as the media began to pry for answers. I’m sure another answer the looming press will “pry for” on Monday is the whereabouts on Drewniak’s next fast-food restaurant job. Good luck with that, Mikey.